The Crematorium Office is open from 9.00 am to 4.30 pm Monday to Friday. Please note the office is not open at weekends or public holidays. The Crematorium Grounds and Remembrance Chapel will be open to the public daily from 9.00 a.m. until 6.00 p.m. (March to September), 9.00 a.m. until 5.00 p.m. (October to February) and until 4.00 p.m. at weekends, Bank or General Holidays. Please see the information below relating to the crematorium. We have also put together a list of frequently asked questions regarding cremations. Do not hesitate to contact us if you need any further information or assistance regarding the crematorium. There is one service chapel at Thanet Crematorium which can seat approximately 80 people. There is additional standing space. At the beginning of each day, there are two shorter service times at 9.00 am and 9.30 am, with a maximum of 15 minutes allowed in the chapel. In addition to this a direct cremation service is offered first thing Monday and Tuesday morning. From 10.00 am services are booked at forty five minute intervals, with a maximum time allowed in the chapel being 30 minutes. Should additional time be required in the chapel, it is possible to book a double service time. There are no restrictions on the content of the service and can be either religious or non-religious depending on the wishes of the family. The crematorium chapel is fitted with a bespoke music system supplied by Wesley Media and music for each service can be requested via your funeral director. Friends and family who are unable to attend the service now have the opportunity to view the service from anywhere in the world by a secure webcam service. There is also the option to watch the service on demand for up to seven days following the service. If a webcast service is required, this should be booked at least two days in advance to enable passwords to be set up. A DVD or CD recording can be created of the service and supplied on either a disc or USB as a personal keepsake. A single photograph or a combination of family photographs can be displayed at a particular time during a service set to favourite music or displayed silently throughout the service. If an organist is required this should be arranged via your Funeral Director. At the end of the service, it is possible to view the floral tributes outside the chapel. The flowers will remain in the cloisters area until the following Tuesday morning. 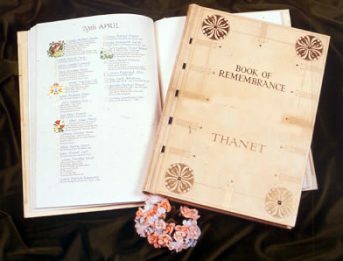 The Book of Remembrance is displayed in the Remembrance Chapel, providing a simple, dignified and lasting memorial. The books, hand made and bound in the finest vellum are inscribed by a professional calligrapher and contain a page for each day of the year. Pages are turned daily (including all public holidays). Entries of five lines or more may be decorated with floral motifs, badges, crests or coats of arms. 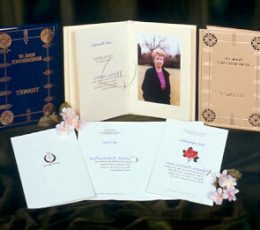 Replicas of the Book of Remembrance entry in the form of memorial cards or miniature books are available. 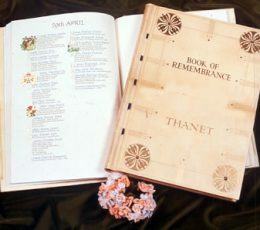 A replica of Thanet Crematorium Book of Remembrance, available in either blue or buff leather, containing the inscription as it appears or other wording as required. 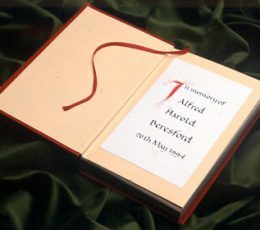 A personal keepsake, these cards contain the inscription as it appears in the Book of remembrance, or other wording as required. They are Gilt deckle edged, size 5 x 7 and are available folded or unfolded (suitable for framing or placing inside the cover of a book). These are available for reproduction in the miniature books or folded memorial cards. Photographs (positive or negative) of the applicants choice are acceptable. The image will be reproduced by photocopy and whilst it can be reduced or enlarged as appropriate, it can only be reproduced as a whole. For miniature books the image is trimmed and sewn into the book opposite the inscription, for memorial cards it is plastic laminated and then glued into the card. The original photograph will be returned with the completed order. Every care will be taken with photographs received, however, neither the Council nor the Calligrapher can accept responsibility in the event of loss and / or damage. 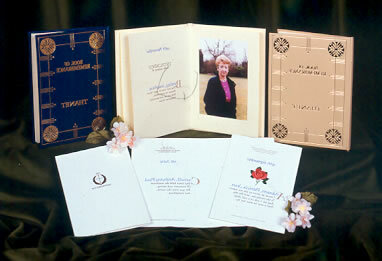 Samples of the Miniature Books and Memorial Cards are also available for viewing at the Crematorium office. 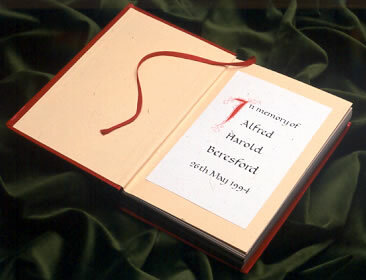 The hymn books and order of service books in use at the crematorium can be dedicated by way of an inscribed plate on the front of the book. These remain in the chapel for the life of the book. Blue leather wall-mounted plaques are available and these are displayed in the Remembrance Chapel for a renewable period of five or ten years. At the time of the first interment in a Garden of Rest plot, we will mark the plot with a small number stone stating the plot number and name of the deceased. However, in many cases people choose to erect a headstone memorial. In order to do this, you will need to contact a stonemason who will be able to discuss the types of memorial available. All memorials erected in the Garden of Rest or Woodlands will need to be fixed by either a BRAMM or NAMM registered stonemason. The stonemason will complete an application form with you and the form will then be sent to this office for approval. Once the memorial has been approved, the stonemason will then be able to arrange a date to fix your memorial. There are certain rules and regulations which need to be adhered to when applying for a memorial, i.e. the way in which it is secured to the ground, sizes etc and listed below is the sizes permitted for memorials in this area. When funeral arrangements are made, it is usual for a final resting place to be discussed. At Thanet Crematorium, we have the following available. 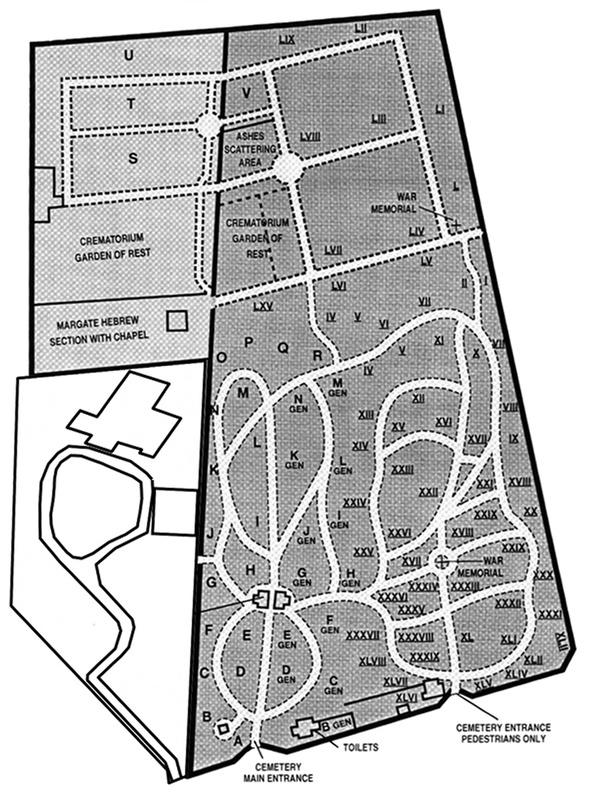 Cremated remains can be scattered in a specified area of the Crematorium, (see map for location). Please note this is an unmarked area, where no memorials are permitted however fresh flowers may be laid here. The lawns at the front of the Crematorium provides an area where two sets of cremated remains can be interred in the same plot. Individual plots are not marked on the ground but can be located via measurements which are recorded in our registers. Again permanent memorials are not permitted in this location, however fresh flowers can be placed either on the lawns or by the adjacent memorial stone. Cremated remains can be buried in a Garden of Rest Plot and there would be provision for another three sets of cremated remains to be buried in the same plot at later dates. In purchasing a Garden of Rest Plot, you would own the right to bury in the plot and erect a small memorial of your choice (please refer to the Garden of Rest and Woodland Memorials for permitted sizes). Should you wish to erect a memorial, this can be carried out via a stone mason and would incur their charges. In purchasing a Garden of Rest plot you would be purchasing the Exclusive Burial Rights of a plot in the Crematorium currently for fifty years. Therefore you will be the person responsible for the maintenance of the plot, the person to sign for any memorials placed on the plot and your permission will be required to open the plot at any time. In the case of joint ownership, all owners will be required to give their consent. Up to a maximum of four people may be joint owners of the EROB, allowing them all the automatic right to be buried in the plot (space allowing) and have equal responsibilities for memorials etc). The deeds will then remain with the joint owners until such a time of the death of the last surviving person, then passing to their executor. Please refer to the burial rights section for further information regarding transferring burial rights. The woodlands burial ground is a small wooded area located at Thanet Crematorium. The paths meander through the woodland area and have been created using the natural lie of the land and trees. The plots will be located either side of these pathways. The plots will be 2’6 X 2’6 which will allow for two interments in spun metal urns provided by your Funeral Director. The exclusive right of burial can be initially purchased for a twenty-five year period, with the option to increase this time after five years. A maximum of two people can be joint owners of these plots and their permission will be required to open (unless one of the owners is deceased, in which cases they have the automatic right to be interred in this plot) or place a memorial on the plot, (please refer to the Garden of Rest and Woodland Memorials for permitted sizes). Should you wish to erect a memorial, this can be carried out via a stone mason and would incur their charges. New in 2017 is our Rose Garden planted with standard roses and bush roses with varieties such as Remember Me, Mum in a Million, Blessings, Peace and Korresia. 2 sets of cremated remains may be interred with each rose and a granite marker bearing a personal inscription of your choice is placed in front of the rose. The dedication period is for 10 years and maybe renewed after that period. There are no Exclusive Rights of Burial with the roses. Throughout the cemetery and crematorium gardens are mature grown trees. Each tree can have up to 4 sets of cremated remains interred at their base. A granite marker inscribed with a personal message can be placed at the base of the tree in memory of those interred there. The dedication period is for 10 years and may be renewed after that period. There is no Exclusive Rights of Burial with the trees. These options can be booked either via your Funeral Director or directly with us by telephoning 01843 577333 and you and your family and friends may attend to witness the interment or scattering. If you wish to hold a formal ceremony of the committal, you would need to arrange this directly with a minister. Should you decide you do not wish to be present at the time of the interment or scattering, this will be carried out by a member of staff 14 days after the cremation, unless specifically requested otherwise to allow a period of reflection. If you are planning on arranging a cremation without a funeral director, please contact the crematorium office on 01843 577333. The following information will give you a guideline of points to consider. The date and time of funeral must be booked a minimum of three days (to allow time for the statutory paperwork to be completed) in advance with the Crematorium Office and paid for in full. If paying by cheque, the cheque will need to clear through Thanet District Council’s accounting system, prior to the cremation taking place. You will be required to provide five sets of forms when booking a cremation. Some of these forms should be completed by the applicant for cremation, i.e. the deceased next of kin or executor. This form allows crematorium staff to carry out preliminary checks to ensure no errors have been made when booking the date and time of the funeral, provides information regarding ministers conducting the service and music requirements and is also confirms the suitability of the coffin for cremation (over page). This form is available from the crematorium office and will need to be signed by the applicant for the cremation. This form indicates the applicant’s wishes regarding the final disposal of the cremated remains of the deceased. Again this should be signed by the applicant for the cremation. Options for dispersal of cremated remains can be found in the Thanet Crematorium brochure. This form details information regarding the deceased and should be completed and signed by the applicant for cremation. Arrangements should be made for Forms ‘Cremation 4 and 5’ (Doctor’s papers) to be completed by Medical Practitioners. These are Statutory documents and General Practitioners and hospitals will have these available for the required doctors to complete. Please note – There will be fees payable to the surgeries/ hospitals for completion of these forms; these fees should be paid directly to them. Cremation Forms 4 and 5 are not required if H.M. Coroner is issuing a Cremation Form 6. If cremation forms 4 and 5 are required, these should be delivered either in person or by post in a sealed Medical forms envelope, addressed to the medical referee at Thanet Crematorium. Cremation forms 4 and 5 are usually released at the same time as the body of the deceased, you must ensure you meet the requirements of the institution releasing the body, i.e. identification, have suitable transport to transport the deceased and suitable facilities to house the deceased until the time of cremation. You should check with the institution that you meet their requirements prior to booking a funeral time to avoid any delays at a later stage. You will need to register the death at a Registry Office. The Registrar’s green certificate must be handed to the Crematorium office. This certificate will not be required if H.M. Coroner is issuing a Cremation Form 6. Cremation forms 4 and 5, and the Registration Certificate must be delivered to the Crematorium at least three full working days before the agreed funeral date to allow the medical referee to complete their checks and sign the Cremation Form 10 allowing the cremation to take place. Arrange for a coffin suitable for cremation. This should have a solid base to allow the coffin to be placed in the cremator, please refer to The Federation of Burial and Cremation Authorities, document “Instructions to Funeral Directors” or the Secretary of State’s Process Guidance Note 5/2, for crematoria, where item 6.10 refers for the suitability of a coffin for cremation. The coffin must be clearly labelled with the deceased name, to enable crematorium staff to complete required identification checks. The coffin is required to be lined with “crem film” for Health and Safety purposes. The deceased may be dressed in “natural fibre” clothing, however no shoes or any other items should be placed in the coffin. This is a legal requirement, as per the environmental agencies that closely monitor the computer generated emissions results given by each cremation; if there are items in the coffin which are prohibited, the emissions reading will show this, thus resulting in possible action being taken against the applicant for the cremation. By signing The Preliminary Application for Cremation, the Applicant for Cremation is signing to accept the terms and conditions stated in 1 and 2 above. Arrange for the collection and transportation of the deceased to the Crematorium for the allocated date and time. Arrange for a minister or person to conduct the service, if required. Please note – there are likely to be fees payable for this which should be arranged directly with the person. Arrange for an adequate number of bearers (usually four for an adult cremation) to convey the coffin from vehicle to Chapel catafalque. If the cremated remains are to be taken away from the Crematorium, arrangements must be made for collection. If a representative of the applicant is to collect the cremated remains, the applicant must inform this office in person of the name of the chosen representative who will be required to produce identification prior to the cremated remains being released by the Cremation Authority. We are confident that the equipment and processes adopted for infant cremation at Thanet maximise the likelihood of recovering ashes. In any rare instance of non-recovery of ashes, we will conduct a review of the cremation process within 48 hours to understand why this is the case. The results of this review will be documented and contain details of any adjustments of our procedure deemed to be necessary, and will be available to next of kin/parent(s) if they wish to view these. We will adhere to our identification procedure that guarantees that the ashes resulting from individual cremations returned to parents are those of their baby. In relation to the disposal of ashes in the case of a private cremation, Thanet Crematorium will only act upon the written instruction of the parent who is acting as the Applicant for Cremation or other person nominated in writing by the parent. If you have any questions or queries about the cremation of your baby, you can speak to the staff at the crematorium office on 01843 577333. Take a train to Margate Station, then it is approximately a 25 minute walk from the station, or alternatively take a bus (nos. 8, 8A, 32, 32A, 34, 34A or 36) which will take you as far as the Victoria Road and College Road junction; it’s approximately a ten minute walk (up hill) from there along College Road, straight across the traffic lights and then left into Manston Road . Follow the sign post from the A28, along George V Avenue (B 2052), then right onto Hartsdown Road. Then turn right onto Manston Road and take the first turning left to the Crematorium.